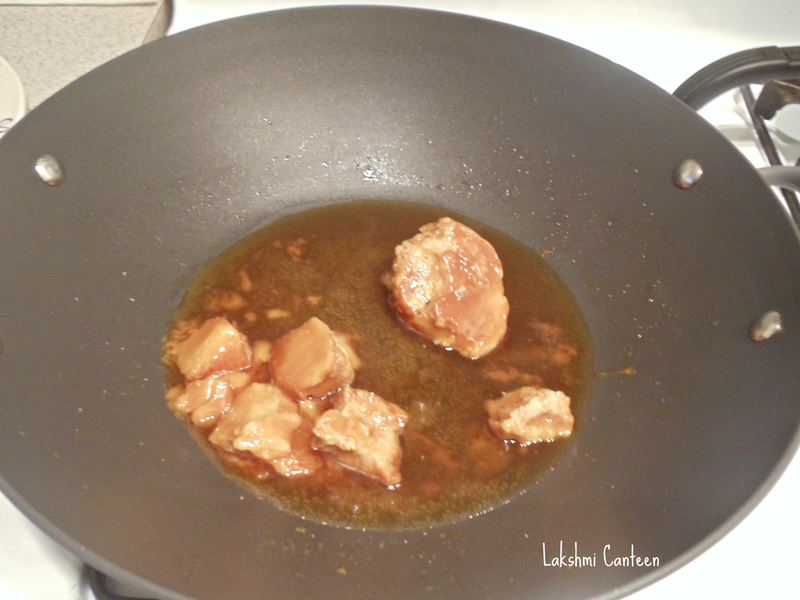 *I used a mixture of oil and ghee to cut down the fat. 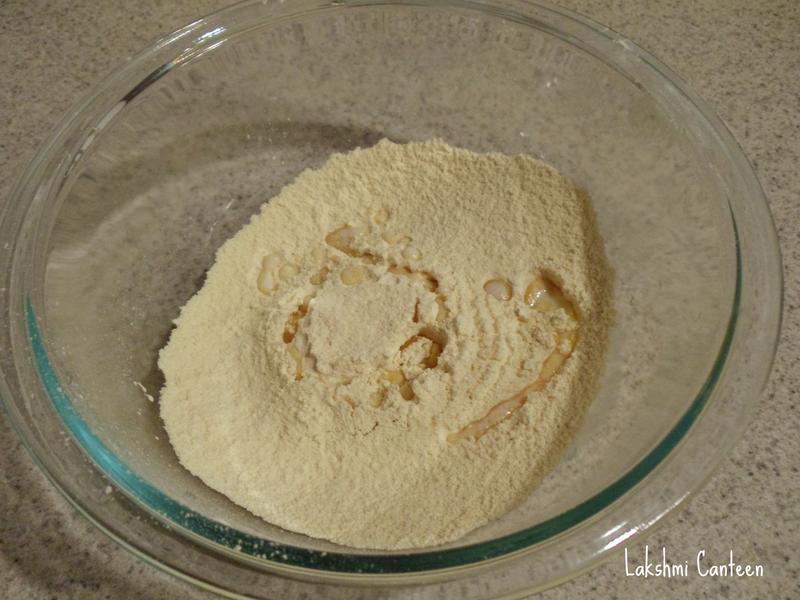 First step is to prepare the Sev: Sieve chickpea flour in a bowl. All melted butter to it. At the bottom of the mould we need to add the plate, which has many tiny holes throughout (use the plate with slight bigger holes). 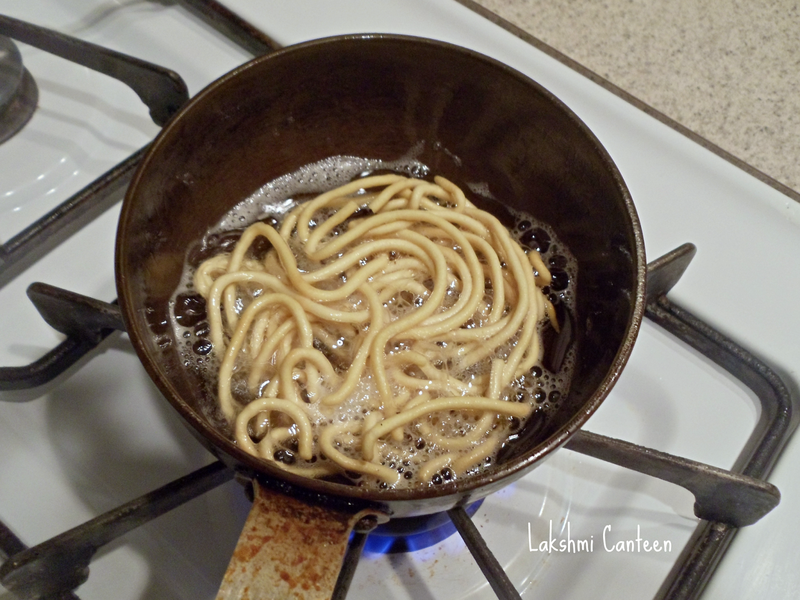 Now put the dough into the greased mould and then start rotating it in clockwise direction in the hot Ghee (or oil-ghee mixture) directly, until there is enough room for the noodles to get fried evenly. To stop the noodles from coming, rotate in opposite direction. 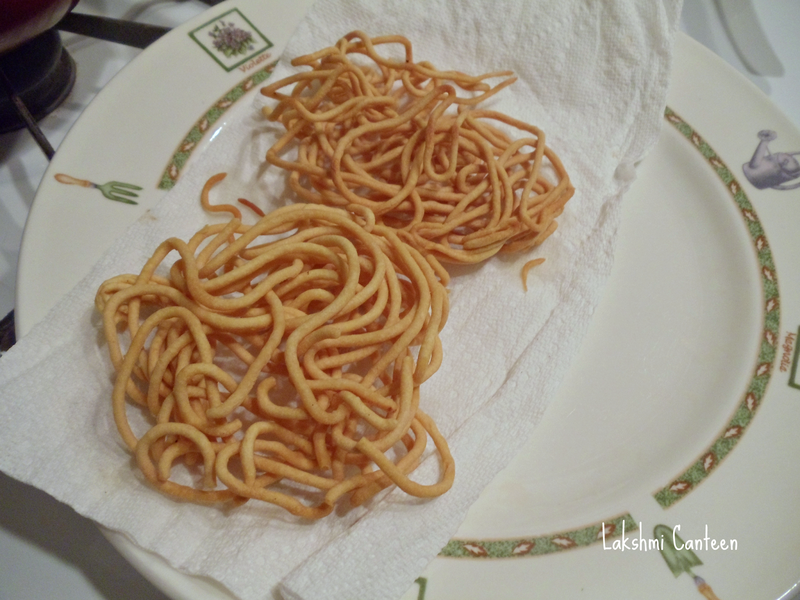 Fry the noodles on a medium flame on either sides, until the sev turns crispy and slight brown. Take out the sev from the oil and drain the excess oil on a paper towel. Karo is ready!! Once it cools down, crush it into small pieces and set in aside. 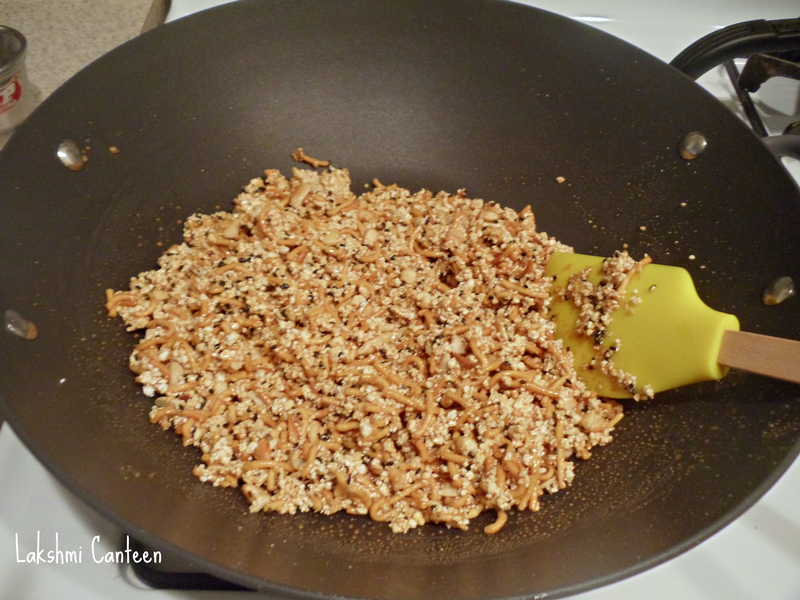 Now take a big pan and dry roast the sesame seeds until it starts to splutter. Then transfer it to a plate. 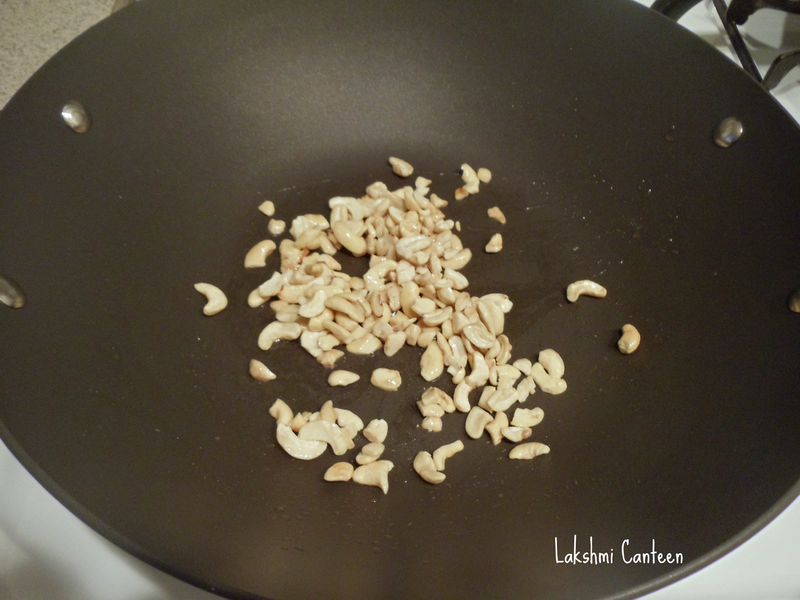 In the same pan add little ghee and start roasting the cashew nut pieces until they turn golden brown. Then transfer it to a plate. 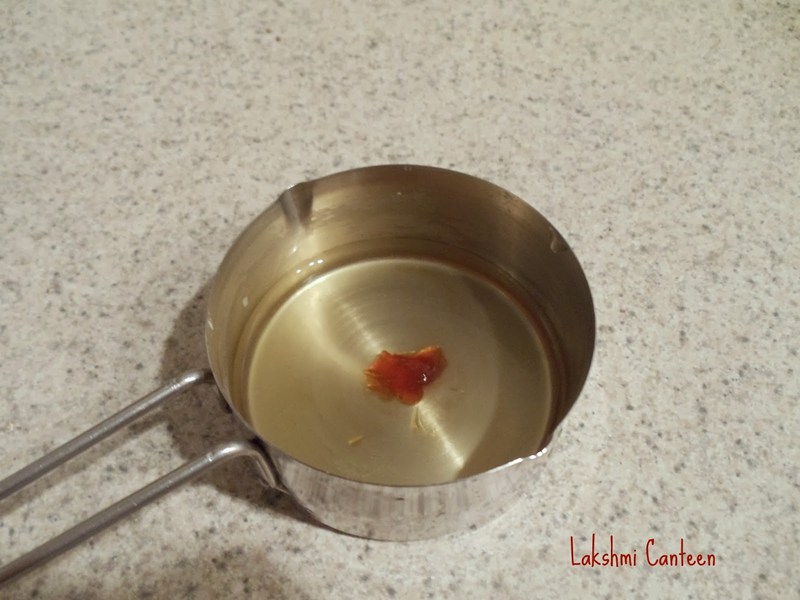 In the same pan, start heating the jaggery on a medium flame along with 1/2 cup of water. The jaggery I used looked like this (This jaggery is very soft and is specially used to make ladoos, burfi, chikkis. This jaggery gives good binding and has a distinct taste). 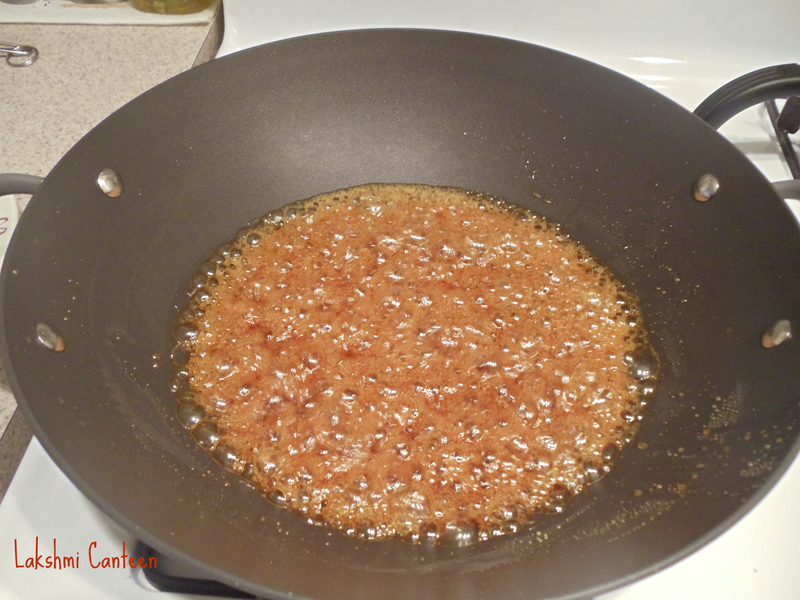 The jaggery begins to melt and starts to boil. 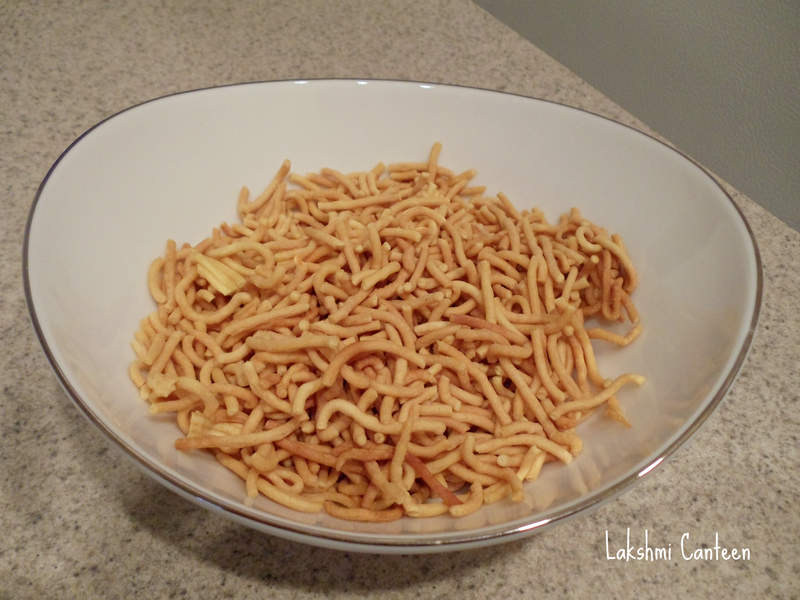 Once this consistency is reached, add the roasted cashew nut, Karo (sev), sesame seeds, cardamom powder, ghee and mix quickly. Then add the coarse powder of popped rice and give a good mix until everything comes together. Allow the mixture to cool (until you can handle the heat). 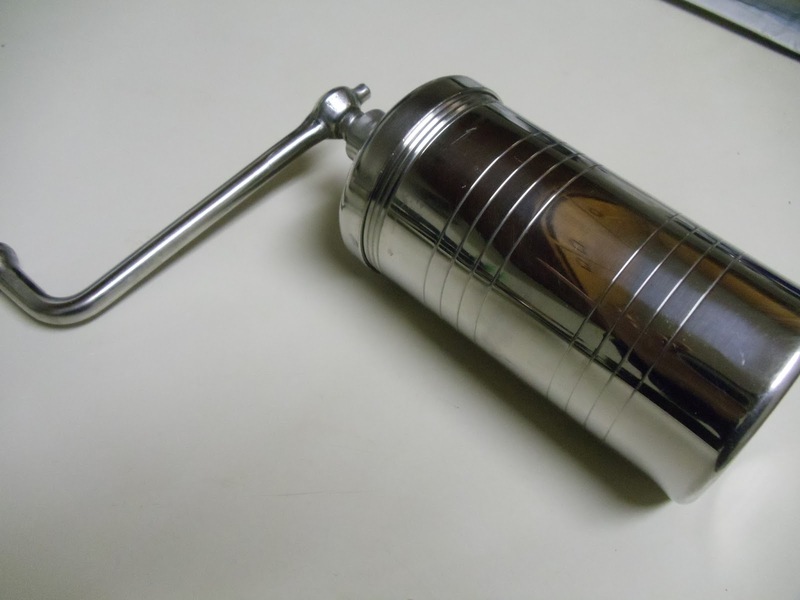 Remember that the mixture hardens as it cools. So it has to be formed into ladoos as soon as possible. 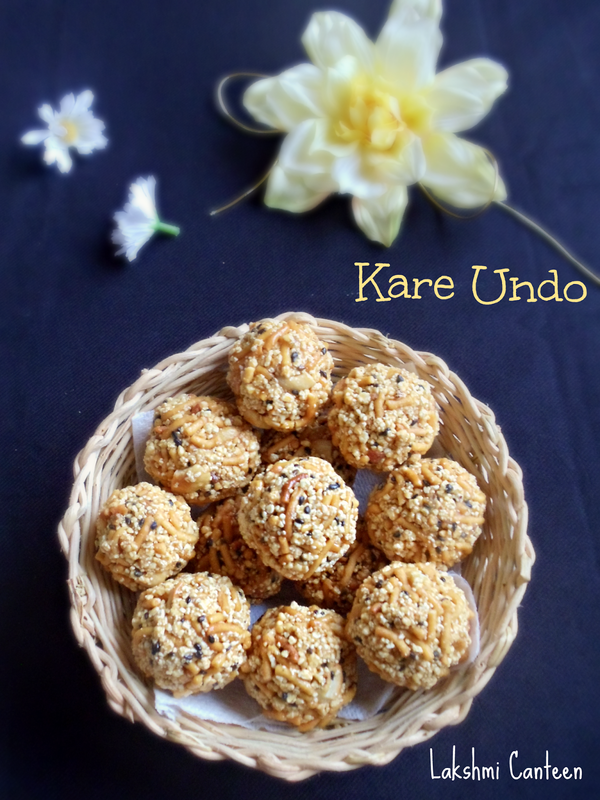 Once it is ready to handle, take desired amount of the ladoo mixture in your greased hands and make a ladoo. Repeat the same for the rest of the mixture. 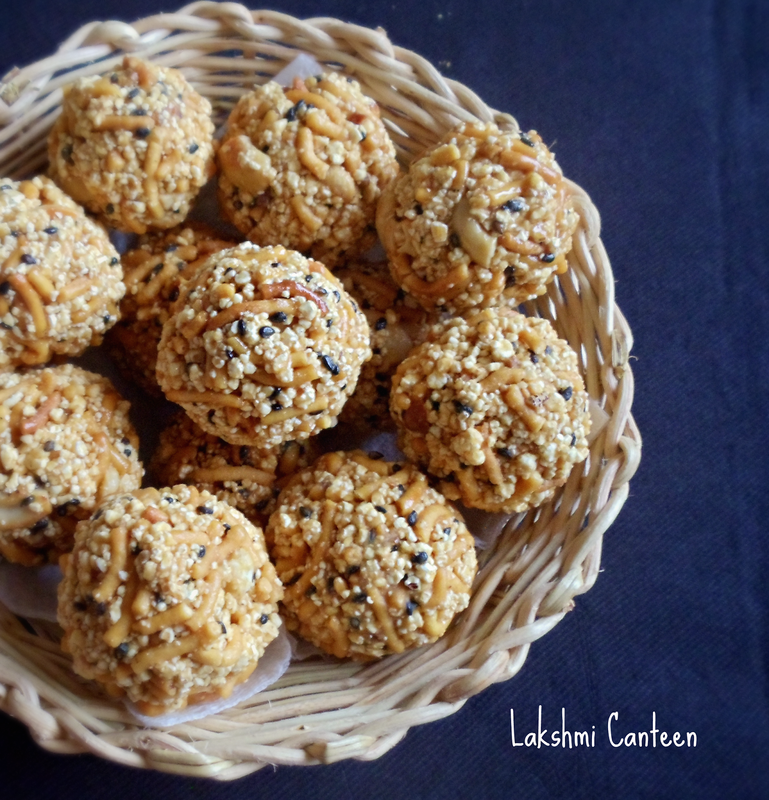 I made a total of 17 ladoos. 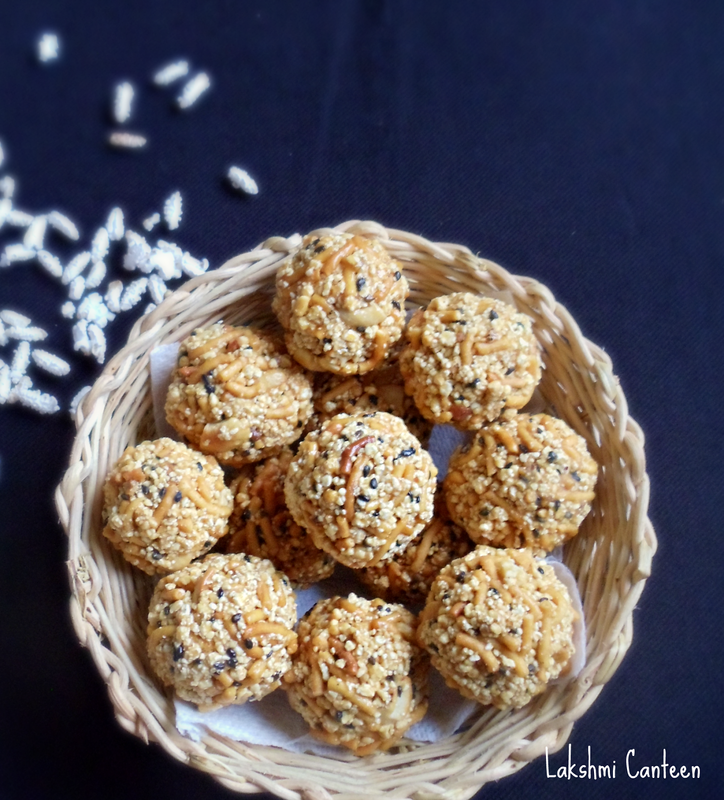 Yummy ladoos..sounds very new to me..a must try recipe!